Checkline DT-311J IP65 Stroboscope Reliability Direct, Inc. Your Direct Source for Reliability, Maintenance, Test & Measurement! 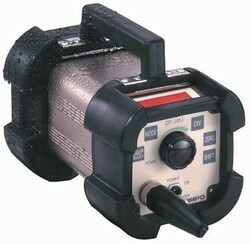 The DT-311J stroboscope is designed for harsh and wet work areas. Where powerful illumination and rugged speed measuring accuracy are required for the textile industry, the DT-311J will perform where other stroboscopes will not. The DT-311J is used to set injection timing, injection pressure, timing of shedding and weft running time of weaving machinery. Rugged-Drip Proof (IP65) Housing, High Performance Accuracy, Special Phase shifting, with Shock Absorbing components and top mounted handle, allows the equipment operator maximum flexibility when setting the timing of weaving machinery. Hand-held or tripod operation they are designed for observing fast repeated motions and for determining RPM or inspection and observation of moving parts by "freezing" or "slowing down" the movement. The instrument can be triggered by means of an external sensor (power supply for the sensor is provided by the stroboscope). The flashes can be delayed either in time or in rotation angle. High level: 5 to 24V Pulse width 2 msec min. Lo level: 0 to 1V Pulse width 2 msec min.